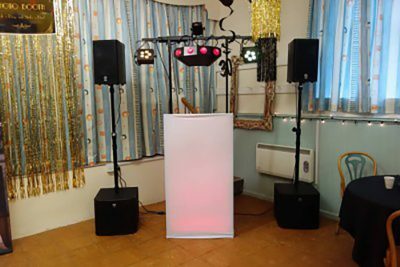 When you hire one of our iPod DJ / DIY disco systems, you get professional sound and lighting equipment in a simple to operate package allowing you to host your own party with your own music. 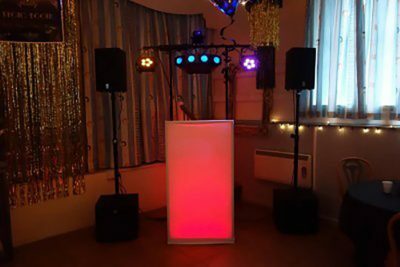 These systems come without the need for one of our DJs in attendance, we deliver, demonstrate and leave you to it, at most venues across Cornwall, or smaller systems can be collected in person from us here in Redruth. Various size options are available from “micro” systems for small, intimate weddings through to “festival” setups for large outdoor parties. Tell us your requirements and we build the right package for you. Speakers – the power and type of speakers supplied are chosen based on size of venue and number of guests. Lights – lighting effects such as colour washes, cluster laser, LED moonflower or other patterns to project across the dancefloor. Plug and Play Mixer – an all-in-one mixer/player that has simple start/stop and volume controls for plugging in your own iPod, iPad, iPhone, laptop, mp3 player, tablet or any other device with a standard headphone socket. Also plays CDs or mp3 memory sticks via USB slot. Stylish “light up” DJ booth to hold everything. All stands, cables and accessories. You can add additional equipment such as wireless microphones, smoke machines, a karaoke add-on, uplighting and more. Saving money – With no need to supply a DJ, the price cost to you is cheaper. When you have your own DJ – they can just turn up and get playing at the party without bringing their own kit. When a DJ would be overkill – for very small occasions when it would be out of place having someone standing in the corner of the room, or when there is no need for interaction and the taking of requests. If you think you will need the added interaction, skills and experience of a DJ, then have a look at our mobile DJ and disco services. Call 07715 104826 today to discuss how to host your own party.